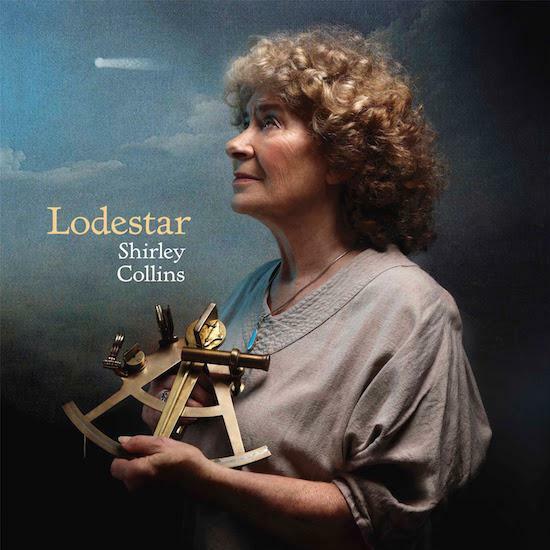 With Lodestar being Shirley Collins’ first album after 38 years of relative silence, it was never going to be anything other than an astounding comeback, was it? As recent interviews have proven, the now 81-year-old matriarch of the British folk tradition has a steeliness that belies the English rose connotations of her vocal style and physical appearance. Emotionally exhausted after her divorce from folk rock lynchpin Ashley Hutchings (around the time of her last album, 1978’s For As Many As Will), and given the sheer number of years spent outside of music, it must have taken a lot of guts for Collins to make a comeback record, let alone one as bold as Lodestar. And what an audacious record it is. Produced by Ossian Brown and Stephen Thrower of Coil associates Cyclobe, it perfectly encapsulates the strange – though thoroughly symbiotic – relationship this bastion of folk traditionalism has with the avant-garde. Shirley’s friendship with gnostic neofolk icon David Tibet is well-documented, and you need only look at last year’s tribute album Shirley Inspired, featuring musical outliers like black metal experimentalists Ulver and guitarist Eric Chenaux, to see how far her influence has spread in the world of leftfield music. But how has this continuum between Collins’s persistent reverence for tradition and the avant garde’s obsession with subversion managed to sustain itself? Lodestar, I’d argue, provides some answers. The album opens with a ten-minute song suite, a return of sorts to the side-long medieval masterpiece ‘A Song Story’ from 1969’s Anthems In Eden. The first part, ‘Awake Awake,’ begins with crystal-clear plucked guitar, interlocking with Collins' wonderful tones. The difference in her voice from her early records is startling: it feels like she may have dropped a full octave and, like that other keeper of the Brit folk flame Martin Carthy, her vocal lines have the strained quality that comes with age. Yet, perhaps because of this apparent difficulty, the sense of Collins’ character is all the more emphatic, as she exhorts the materialistic people of England to turn their lives to matters spiritual, lest ‘death will rot your bones and your flesh will melt away.’ The perennial pertinence of folk-song is a well-worn cliché, but here it bears repeating: ‘Awake Awake’ could comfortably sit alongside the latest Adam Curtis film as an indictment of the modern era. Next comes an original composition for hurdy gurdy by Ossian Brown. Here, the terrifying potential of the much-mocked Gallic folk instrument is unleashed full-force; ‘The Split Ash Tree’ comes off as portentously as any doom-drone record. It might seem strange to some as to why members of a subversive psychedelic experimental group like Cyclobe would put so much time into producing an exquisitely-recorded album for an octogenarian folk singer. ‘The Woods Are Alive With The Smell Of His Coming’: hardly ‘A Blacksmith Courted Me,’ is it? But with this song-suite it all begins to make sense. Lodestar’s opening track is an arresting piece of experimental folk, and by the time the Morris men’s bells begin to jingle on ‘Southover’, the continuum between folk traditionalism and English music’s most depraved subversives is made clear. In this context, Coil’s credo of ‘ritual music for the accumulation of male sexual energy’ couldn’t be a better description of Morris dancing. The remaining arrangements fall closer to the sound established on the Collins albums of old. In parts, the daintily plucked guitar of the stately ‘The Banks Of Green Willow’ recalls the oddly mathematical nature of Shirley’s late sister Dolly’s keyboard arrangements. Patches of roughness are brought in elsewhere by Collins’ collaborators; the bowed cymbals and pattering drums of free jazz/folk firebrand Alex Neilson bring much textural nuance, while Brown and Thrower’s occluded psychedelics – particularly the somnambulant stereo panning on ‘Death And The Lady’ – add a subtle sense of unease. But unease doesn’t merely come through in the production: it’s also there in the marrow of the songs that Collins has collected for the album. The choice to not only include ‘Death And The Lady’ on the album – a track that she recorded as a younger lady over 40 years ago – but also make it the lead single, seems oddly portentous. The promotional video made these connotations only serving to heighten this, with the Bergman-referencing melange of gloomy symbolism complementing the heavy, scythe-like slide guitar of the arrangement. Meanwhile, album closer ‘The Silver Swan’ is literally a swan song: a heart-burstingly bittersweet folk ballad that brings to life the plight of the dying bird against a melt-in-the-ear arrangement of violin and organ. It’d be crass to cast Lodestar as Collin’s Blackstar; but, nevertheless, a sense of a woman looking back on a long life, and towards an uncertain future, feels inherent. Yet despite all of this, Lodestar is in no way a navel-gazing reflection on mortality. The short comedic ditty ‘Old Johnny Buckle’ provides a welcome moment of levity, while the soaring melody and sweetly chiming dulcimer of ‘Pretty Polly’ is among some of Collin’s most emotionally affecting work – the chest-beating ballad is enough to make you believe in love again. Meanwhile, the album’s penultimate track, ‘The Rich Irish Lady/Jeff Sturgeon,’ is a full-on Appalachian hoe-down, with the rich sonorities of the double-stopped violin and banjo reaffirming the transatlantic folk continuum posited by Cecil Sharp in a brisk and breezy dance. So, in the end, Lodestar sees Shirley Collins creating a boundary-pushing, exhilarating work by doing nothing other than what she does best: reanimating the folk songs of Britain with all the respect and veneration she feels for them. Given the strength of this woman, evidenced in her artistic triumphs past and present, it’s unsurprising that her comeback album is invested with grace and audacity, from its experimental flourishes to its reverent traditionalism. God save Shirley Collins: the Real Queen of England!